This book is the first in a projected series on Evolutionary Cell Biology. 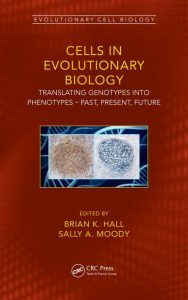 The intent of this book is to demonstrate the essential role of cellular mechanisms in transforming the genotype into the phenotype by transforming gene activity into evolutionary change in morphology. This book evaluates the evolution of cells themselves and the role cells play as agents of change at other levels of biological organization. Chapters explore Darwin’s use of cells in his theory of evolution as well as Weismann’s theory of the separation of germ plasm from body cells that influenced our understanding that acquired changes are not passed on to future generations. The study of evolution through the analysis of cell lineages during embryonic development is discussed. Discovery that cells exchange organelles via symbiosis led to a fundamental reevaluation of prokaryotic and eukaryotic cells and to a reorganization of the Tree of Life. Identification of cellular signaling centers and mechanisms responsible for cellular patterning as mediators of phenotypic change during evolution is presented. Chapters present evidence for the powerful new synergies between cell biology and evolutionary theory.